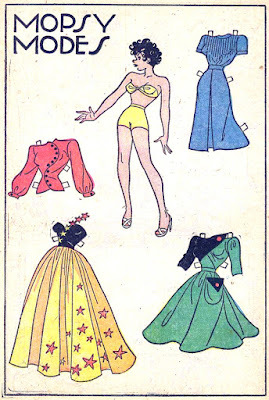 It seems as if some of the most well-known women in the early days of newspaper cartooning were the ones who A) drew very attractive women, and B) had a great eye for fashion. I suppose one could easily argue that combination of being able to draw what men and women ostensibly both wanted to see (pretty girls for men, fantastic fashions for women) is what made them well-known, but I suspect that's a somewhat superficial and dismissive argument in at least most cases. In any event, one of these well-known cartoonists was Gladys Parker. She began cartooning professionally in 1928 and took over the already-popular Flapper Fanny Says strip in 1930. Parker started her most well-known strip, Mopsy, in 1939 and continued working on it until she retired from cartooning altogether in 1965. On Strips: The First Crossover? On -isms: Pini or Telgemeier? On History: Remember Those Old Comics? On Strips: Andy Capp Talcum Powder?